It was a misty morning so I took my time as everything was soaked. The campsite cafe was open for breakfast from 9am so I waited for scrambled eggs on toast and a coffee before packing up. I finally got going at 10.30 and the sea mist still hadn’t cleared. 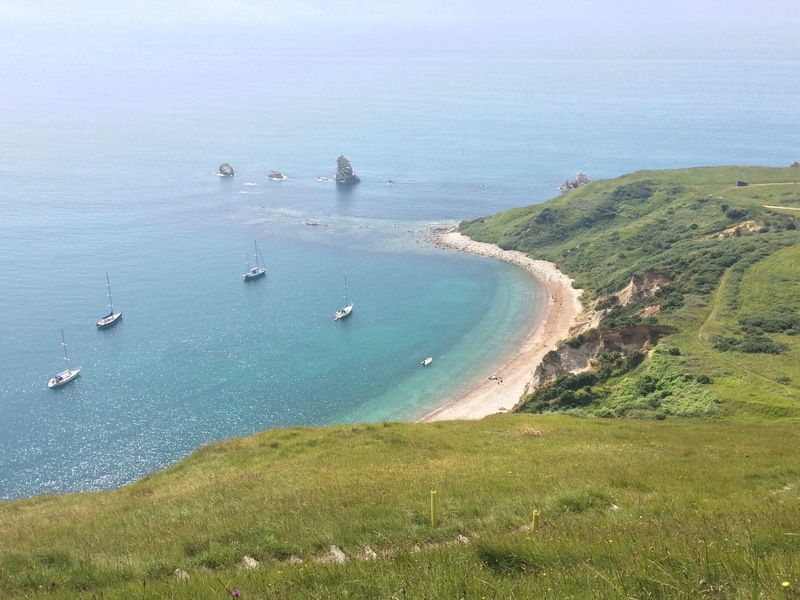 On the walk to Lulworth Cove I passed lots of people heading for the beach at Durdle Door and none of us could see further than a few metres ahead. That was enough to see the damage that the huge volume of tourists is doing to the environment around here. 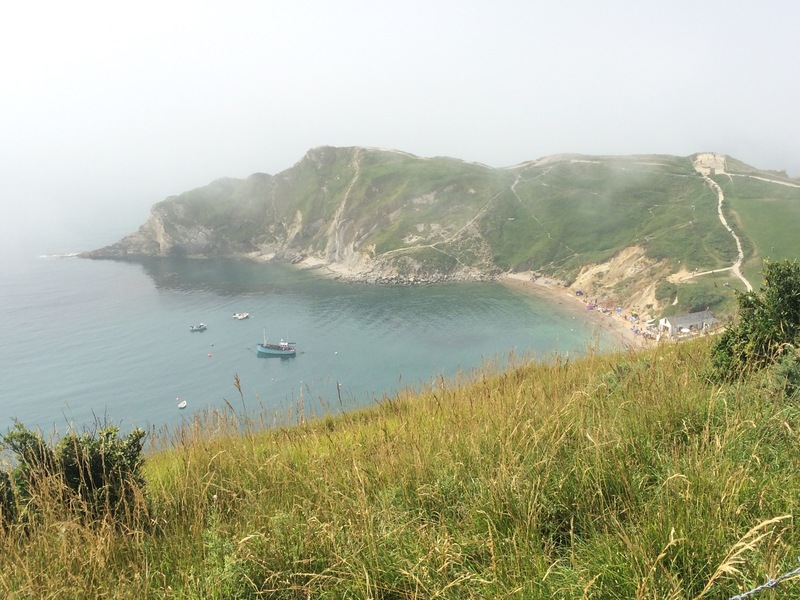 Lulworth Cove was pretty and busy. 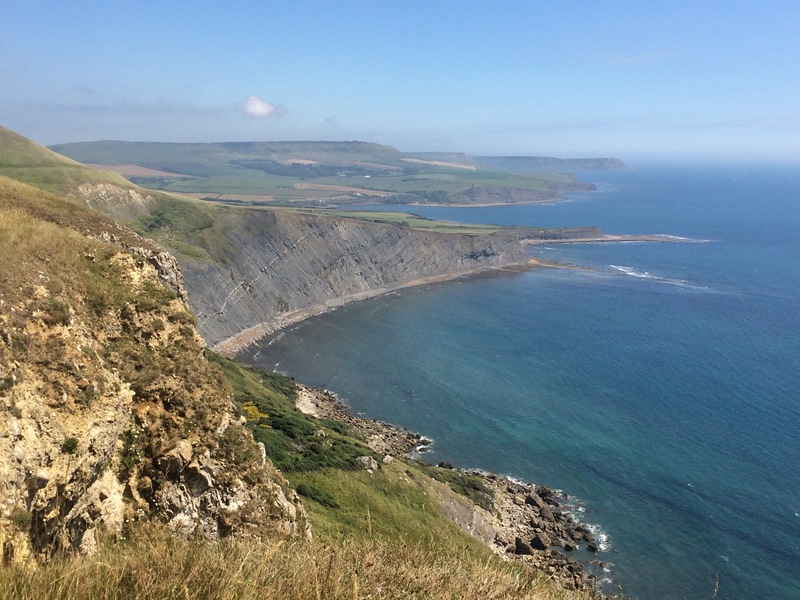 I popped into the heritage centre to read about how the Cove demonstrates all the Jurassic Coast rocks in one sweep. 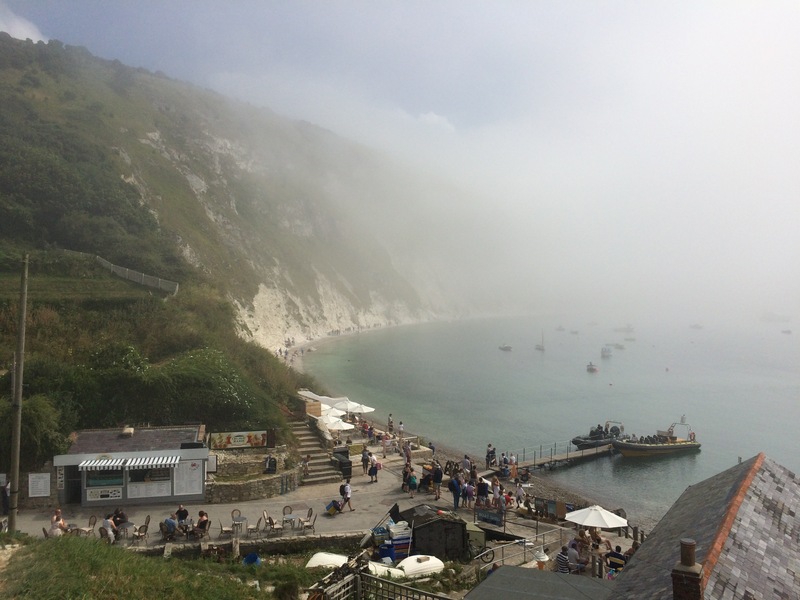 Unfortunately I couldn’t see it as the whole place was shrouded in mist. I didn’t hang around, just long enough to buy a sandwich for my lunch. 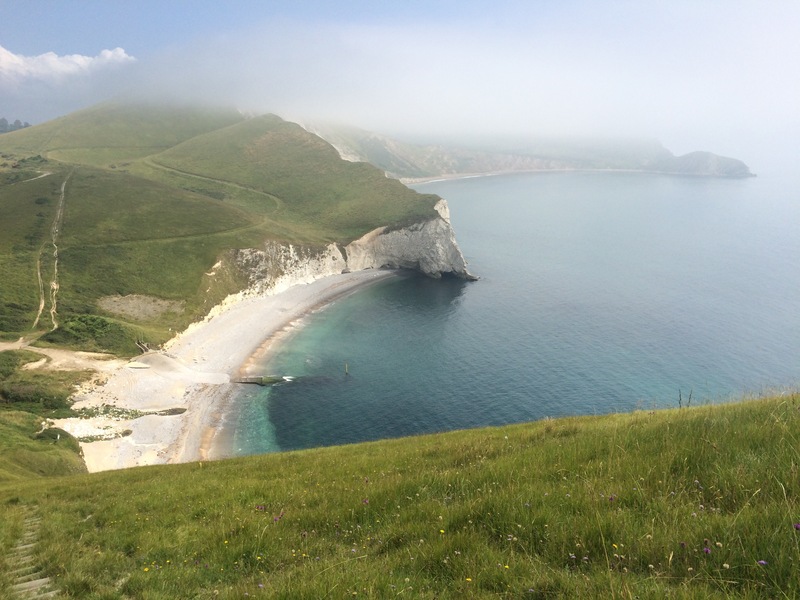 I had timed my walk to arrive at Lulworth on a weekend so that the Ranges would be open to walk through. I gave this extra attention because I had tried to walk this section of coast once before and the Ranges had been closed, which necessitates a 13 mile diversion inland. I had a minor panic when I saw a red flag, but I think it was left flying to designate that the Fossil Forest was closed due to landslips. only a small cliff to climb! 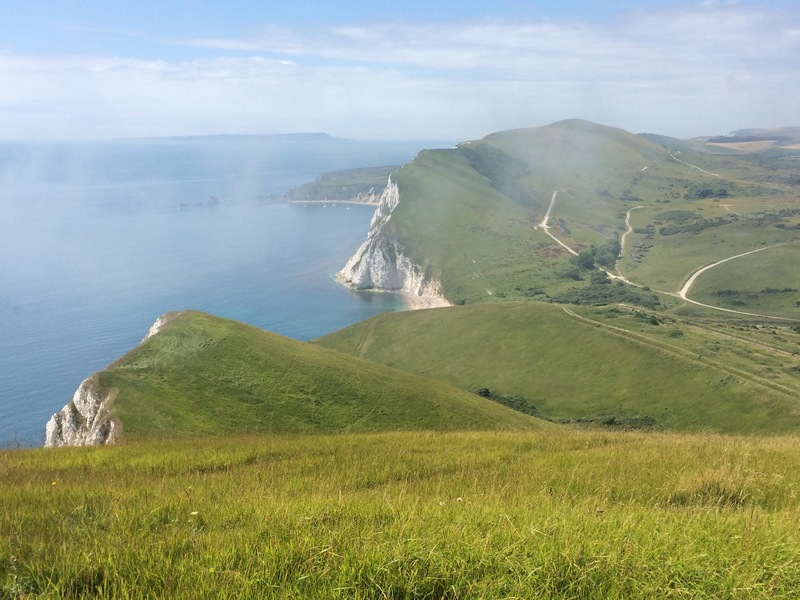 The Lulworth Ranges are well worth walking through. They have those folded up cliffs and, unfortunately, the path goes straight up and over them all. It was hard, hard work walking up and down in the heat. 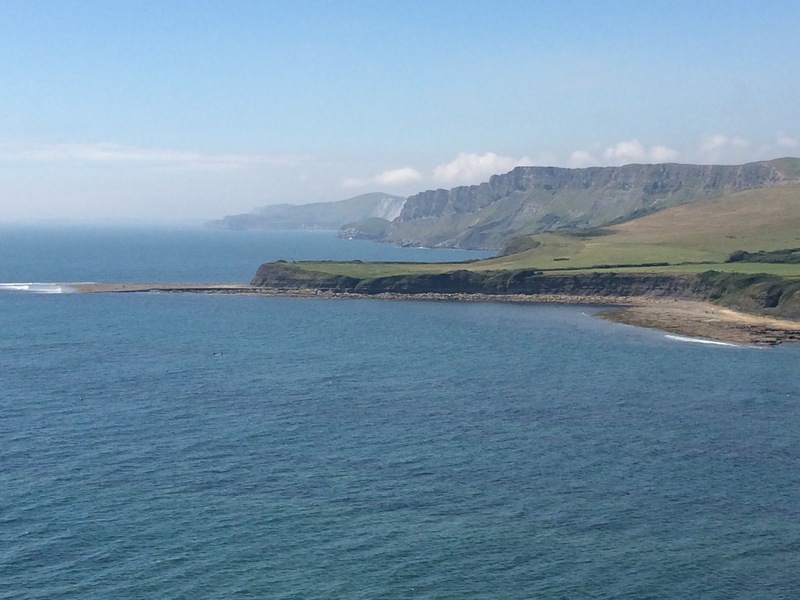 There are 3 bays within the ranges: Mupe, Arish Mell and Worbarrow. 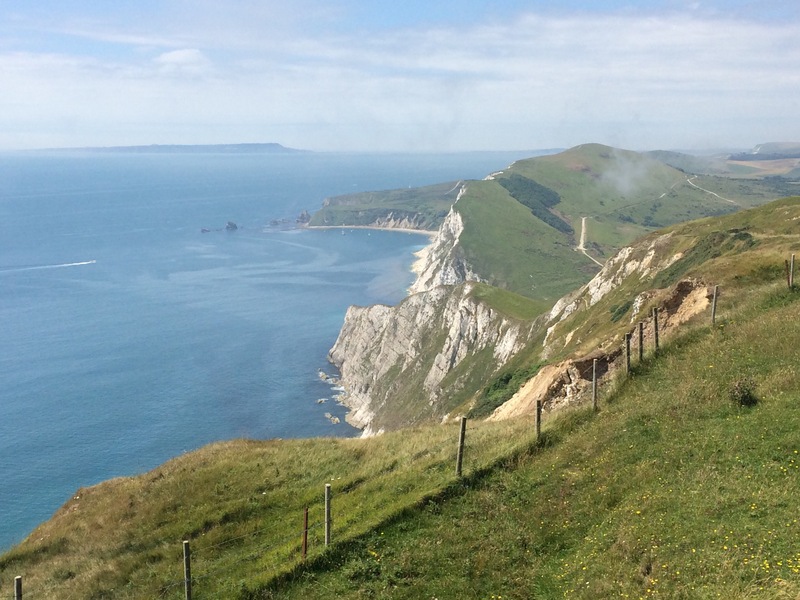 They are all along one long sweep of bay between Mupe Rocks and Worbarrow Trout. 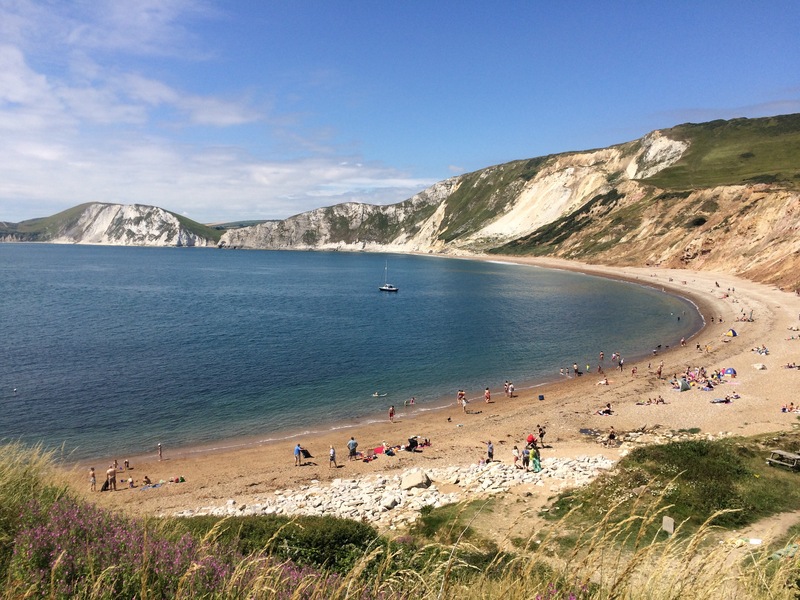 Worbarrow Bay is the one that the public go to when the ranges are open and I thought it looked lovely; beautiful sand and clear blue sea contrasted against the chalky cliff. 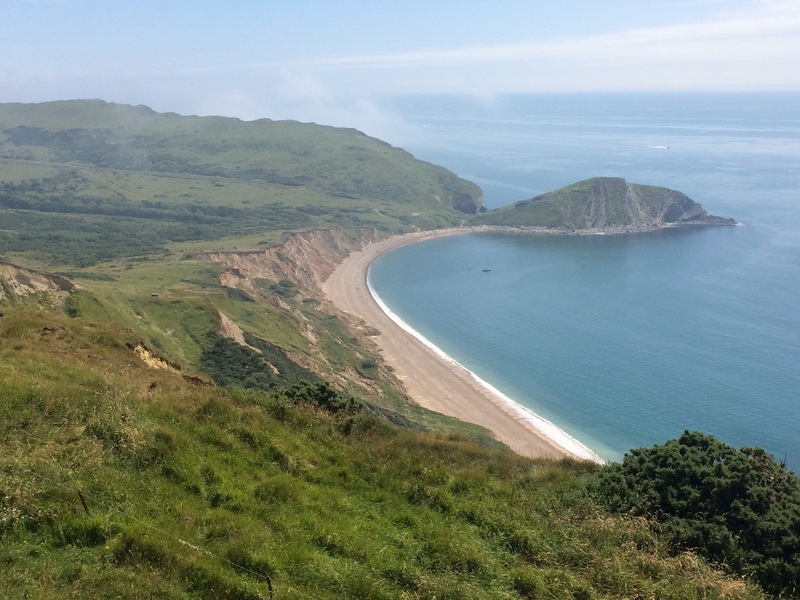 Worbarrow was once a thriving fishing community and coastguard station. 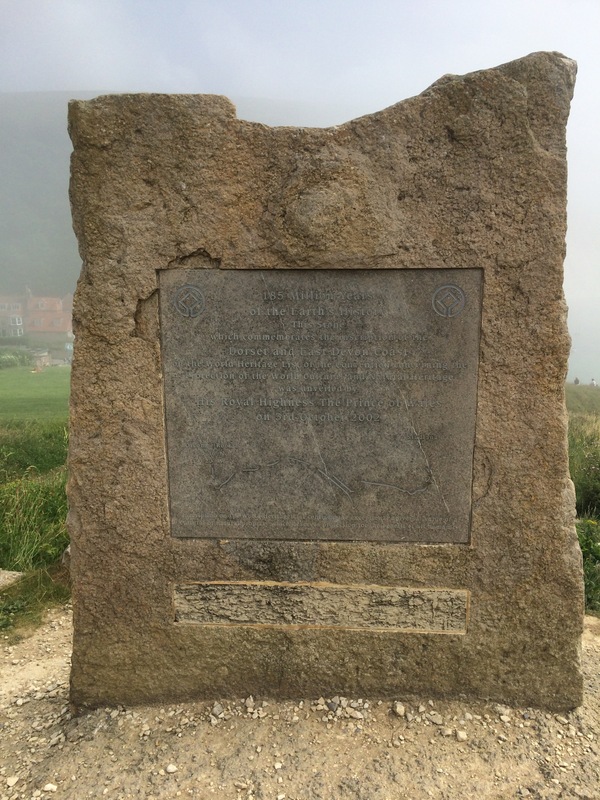 It was Evacuated in 1943 for D-Day troop training and the villagers never returned. 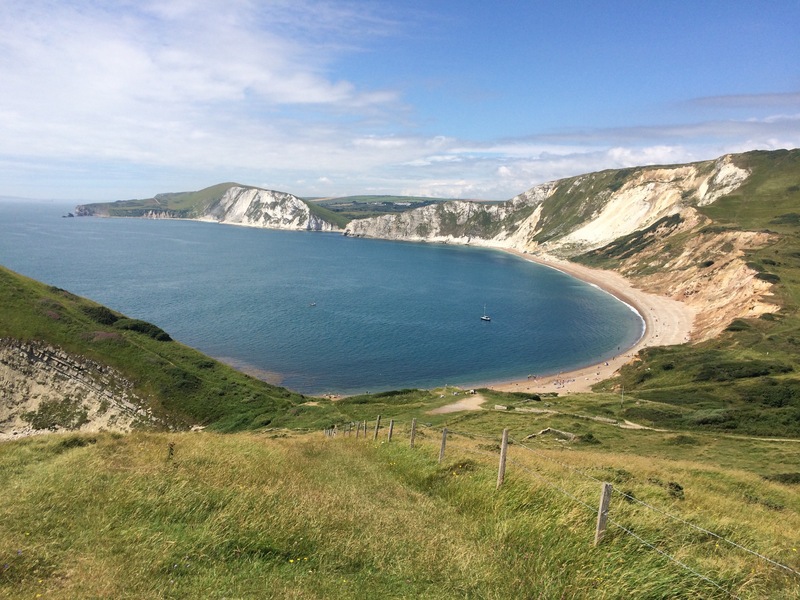 The walk up and down Flower’s Barrow (once an Iron Age fort) to get to the Bay was worth it as the 360 degree views were amazing. Inland I could see Lulworth Castle and way beyond, as well as up and down the coast. 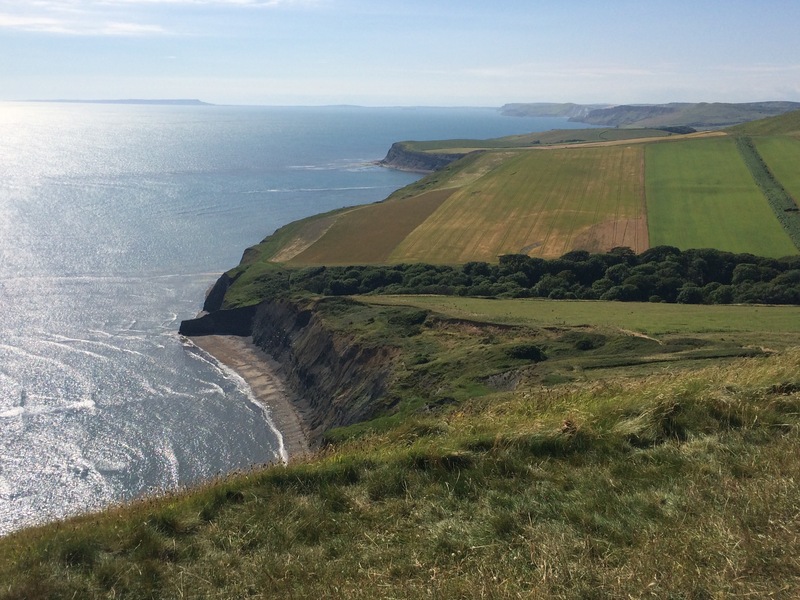 Another climb up onto Gad Cliff and then I was walking on the edge, looking down into the valley containing Tyneham abandoned village, hidden amongst the trees. I had been recommended that this was a good place to visit, but I saved it for another day and carried on. 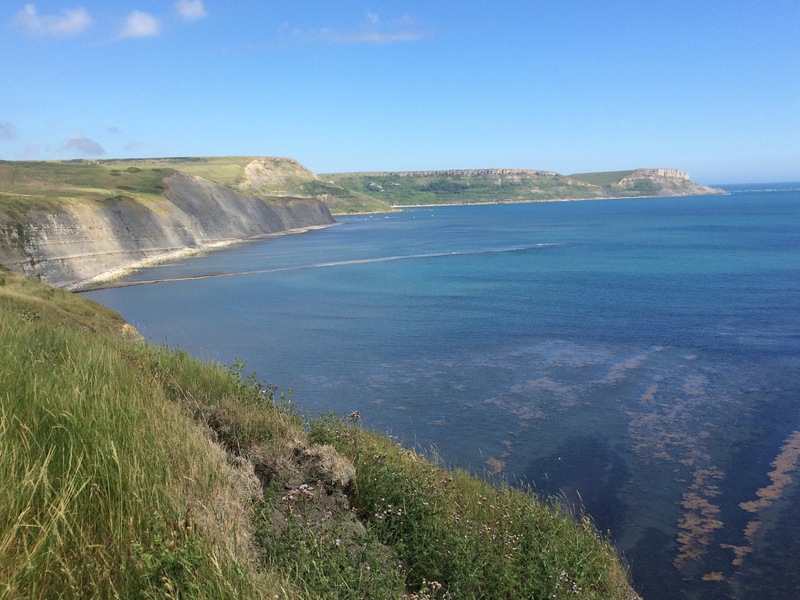 Another very steep downhill to Kimmeridge Bay and my first live sighting of an oil well. 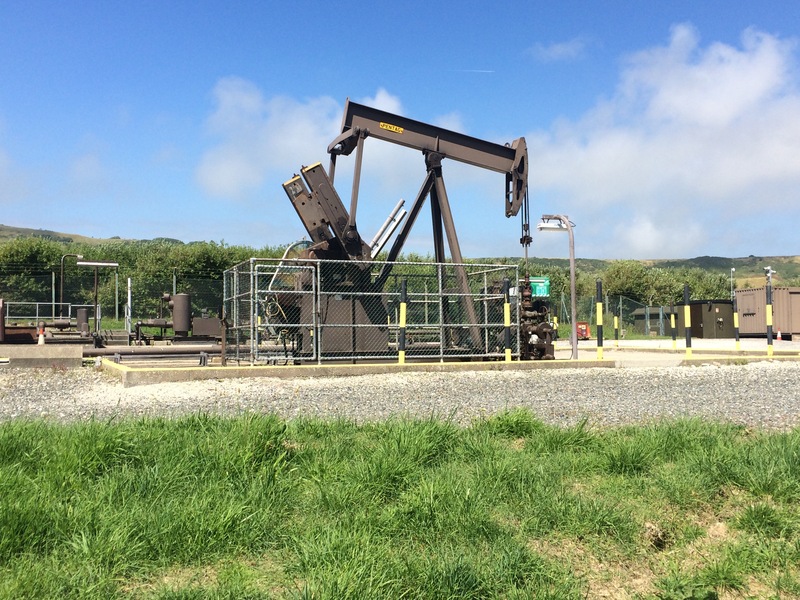 BP’s Kimmeridge Wellsite has been producing oil continuously since 1969; it currently produces 80 barrels a day. 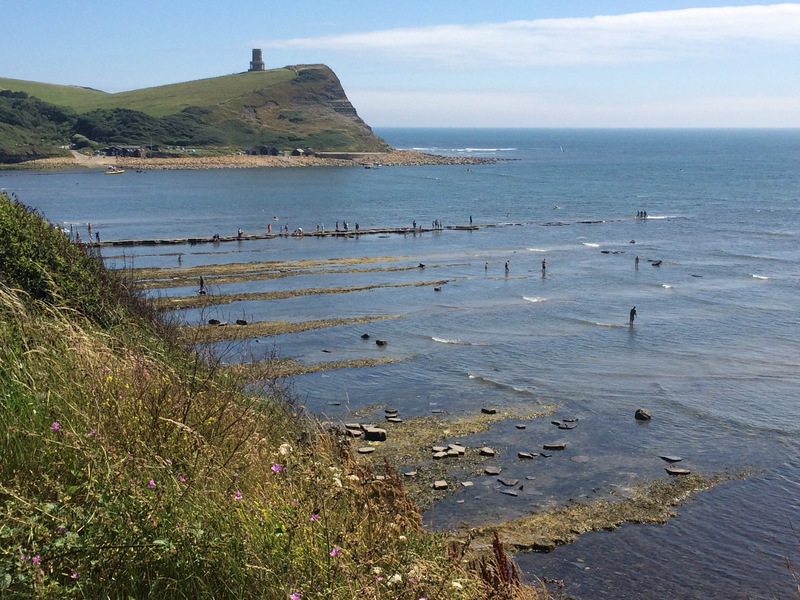 Kimmeridge Bay was interesting as the chalk cliffs had disappeared and left rocks containing a thick sequence of Kimmeridge Clay, which made the water muddy-looking. It was still busy with people because there were extensive ledges that were exposed at low tide and it looked like this gave rise to some good rockpools. Uphill again. 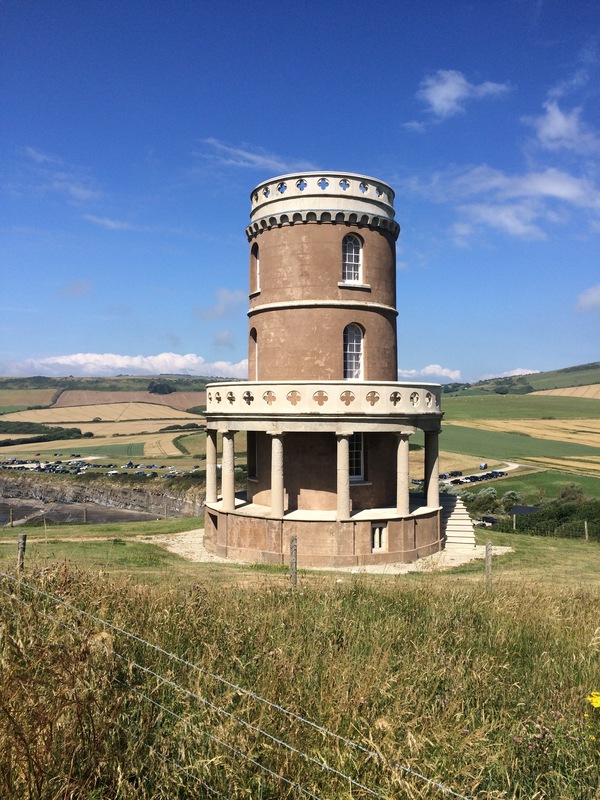 Overlooking the Bay was Clavell Tower, built in 1830 as a folly and an observatory. The tower has been moved further inland from its original site to protect it from the coastal erosion. 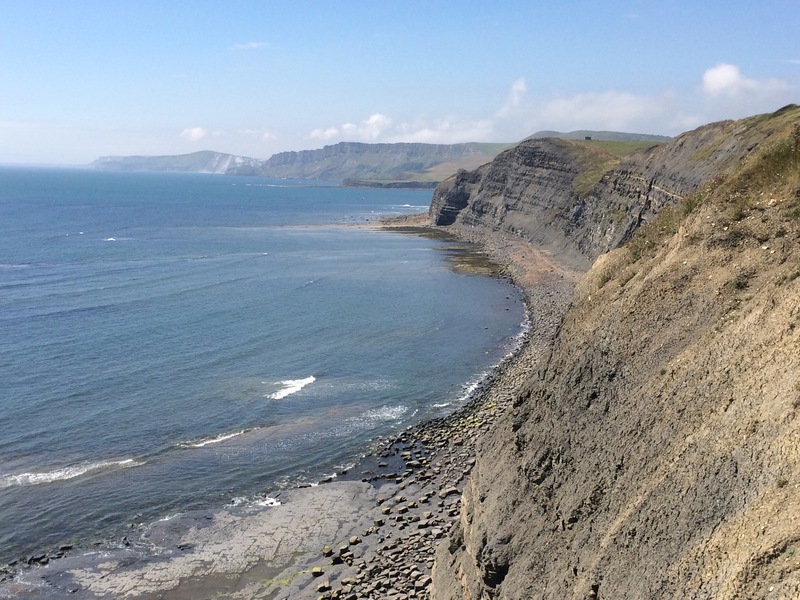 Looking over the edge of the cliff I could see Kimmeridge Ledges, flat lengths of rock/clay sticking out into the sea. 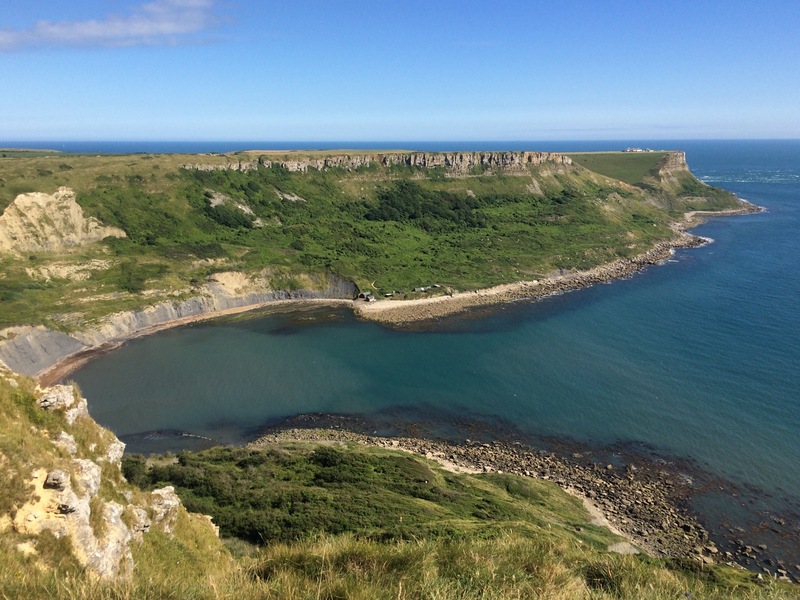 Eventually I reached Chapman’s Pool and headed inland, up a short valley, to the camping field on the edge of Worth Matravers. I was lucky because the campsite had only opened the previous day. It was very basic, just a farmer’s field with a few portaloos and portashowers. There was only 1 water point where one had to wash hands post toilet, collect drinking water and wash any pots and pans. Slightly chaotic! The farmer’s wife and daughters had set up a small stall offering tea and cake (I had some of that on arrival), burgers in the evening (I had one of them) and breakfast baps in the morning (something to look forward to). I had my first ever portashower (not recommended on a hot day) and headed out to the pub. The Square and Compass is a well known, and very popular, ale house. The queue stretched outside the door and it took me 15 minutes to get served. This was because the pub is so old fashioned that it does not have a bar – local beer and cider is drained from barrels and served through a hatch. Food is on offer: meat or vegetable pasties only. It was a very quirky place. I sat inside a small room next to the fossil museum that the pub has set up and chatted to a man who was sea kayaking around the area. This is a very popular sport around the Isle of Purbeck. There was some live music in another room but it was too difficult to move anywhere so I stayed put. A fascinating place. 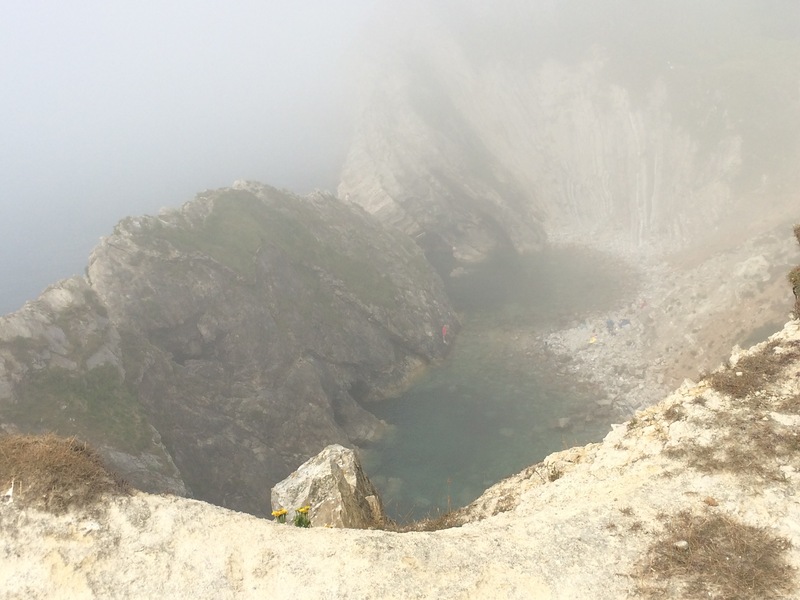 walking the cliffs of Lulworth Ranges is not for the faint hearted! Great to have you back on the blogs Luc, have been missing them! It’s a gorgeous day in Northants, and we have Ivor (and Ben, Monica and Lyra) with us. Ivor sends his love, I will show him some of your posts later. 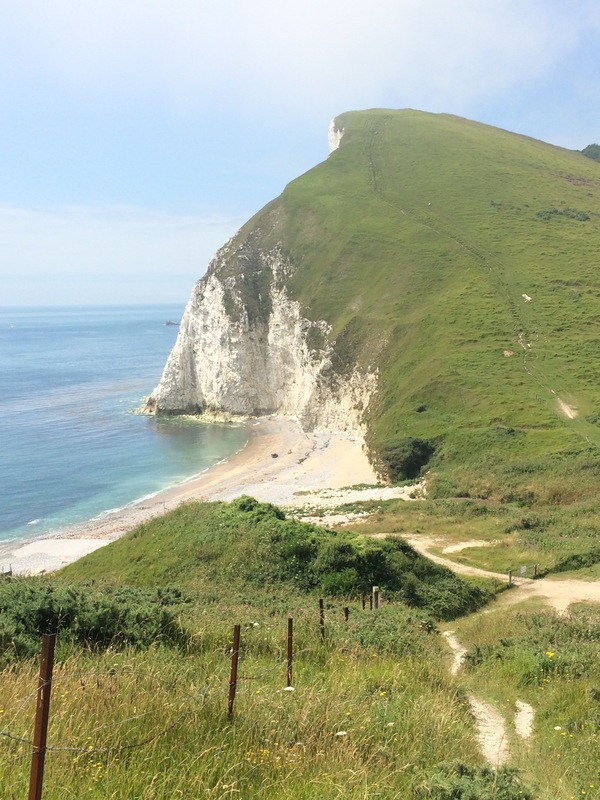 Loved the Durdle Door posts, brought back many memories. 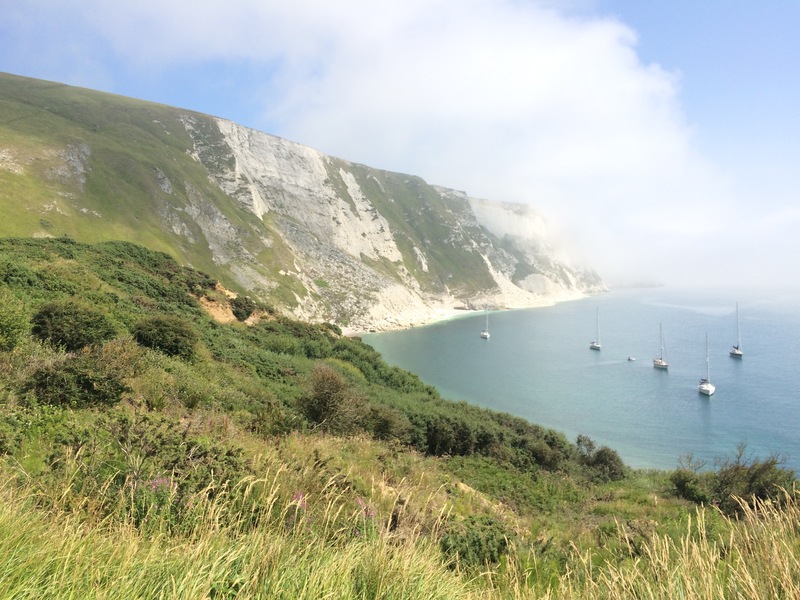 Do you need a place in/near Brighton? I have theatre friends there, let me know. forward to your blogs so much, what will we do when you finally get home?? 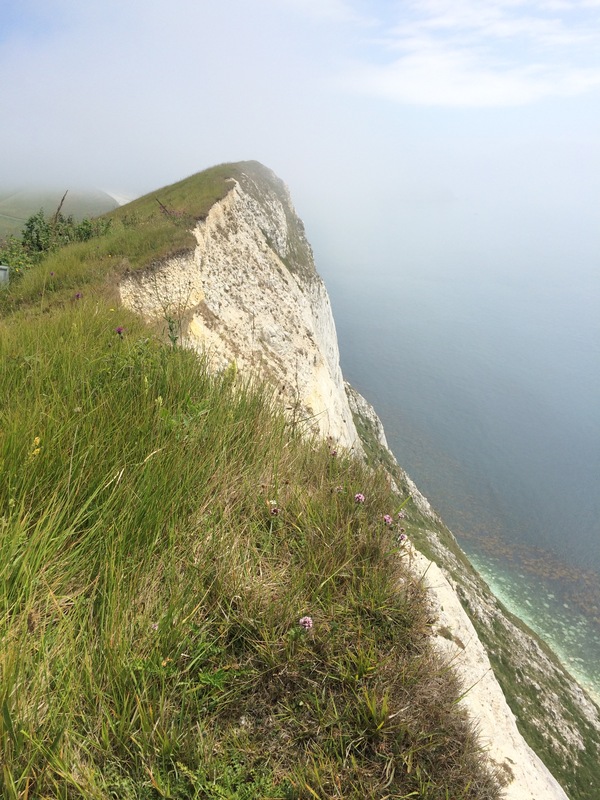 Those photos scare me – please don’t go too close to the edge!! Another hard day……but 14 miles in bag. Well Done Juice. Please tell your readership that you not now going to Kayacking around the British Isles or something equally strenuous. I might have to come with you!